The kitchen has a complete service for 4 with everything needed to cook meals. 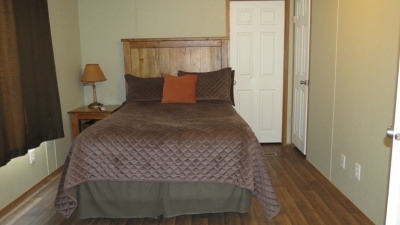 Each bedroom has a full bath, a walk-in closet, and free cable TV. 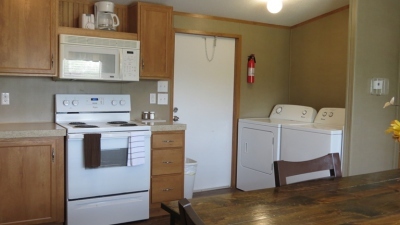 Each lodge building consists of 4 bedrooms, a kitchen, and a laundry with a washer and dryer. Each bedroom has a walk-in closet, a bathroom, and a private entrance. The kitchen is in the middle of the building with 2 bedrooms on the left and 2 on the right. The kitchen is accessble from each adjacent bedroom and also has a separate entrance on the deck.